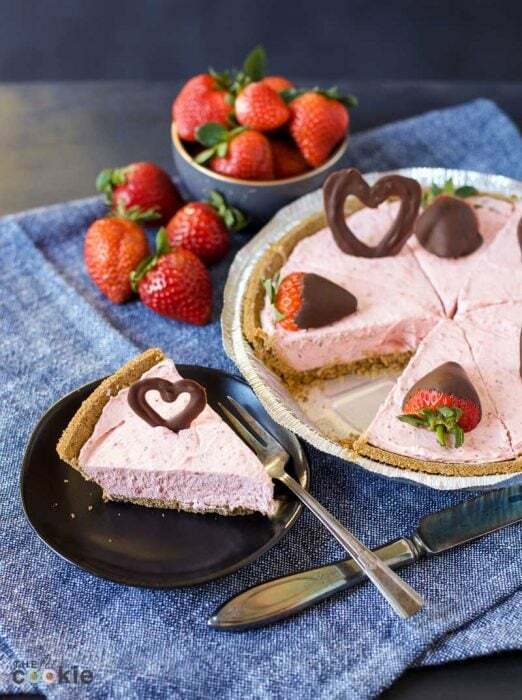 Serve up this pretty pink Strawberry Cheesecake for Valentine’s Day or whenever the mood strikes. It’s gluten free, dairy free, peanut free, and vegan! 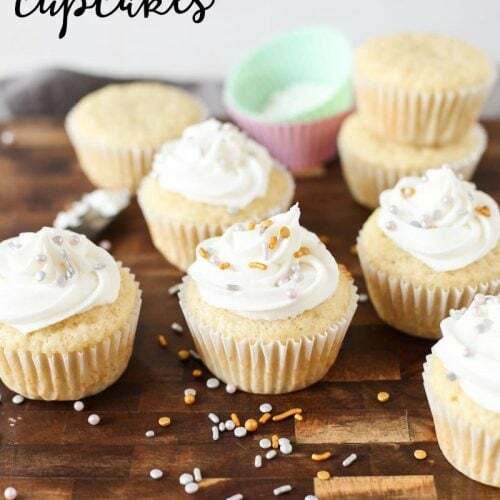 Sometimes the most popular recipes on our blog are the ones I almost didn’t post! A couple years ago, I made an Oreo Cheesecake for my son’s birthday and took some quick photos before we ate it all up. I almost didn’t get photos or a recipe written, but decided to anyway. 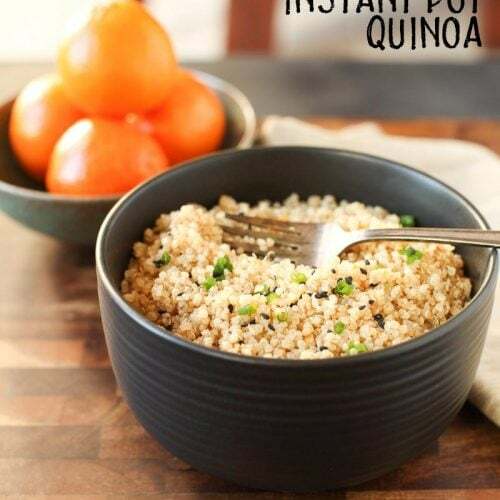 Good thing I did, it has become our most popular recipe! 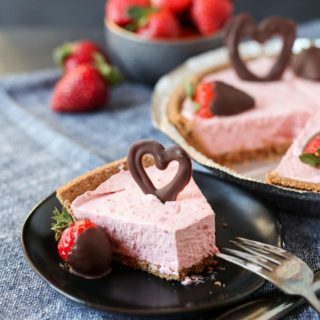 With Valentine’s Day is coming up, I decided to make a pretty pink colored dairy free Strawberry Cheesecake, but you can make this any time you want (no waiting for February!). 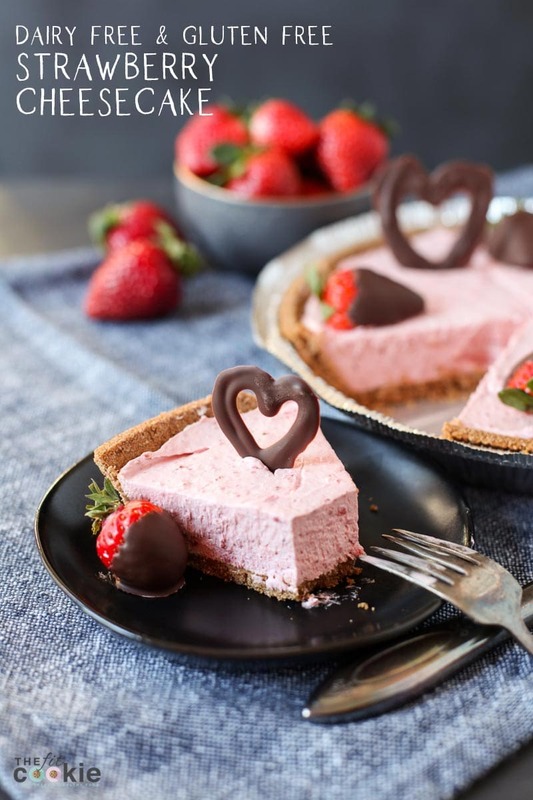 We use freeze-dried strawberries in this recipe, so you don’t have to worry about finding fresh strawberries out of season for this strawberry cheesecake, unless you want to garnish with dipped strawberries. The great pink color in this vegan cheesecake is completely all natural and from the strawberries, no food colorings are added. I personally like the lighter pink color of this cheesecake the way it is, but you can always add a natural food color powder or beet powder to this to make it brighter/deeper pink if you want. 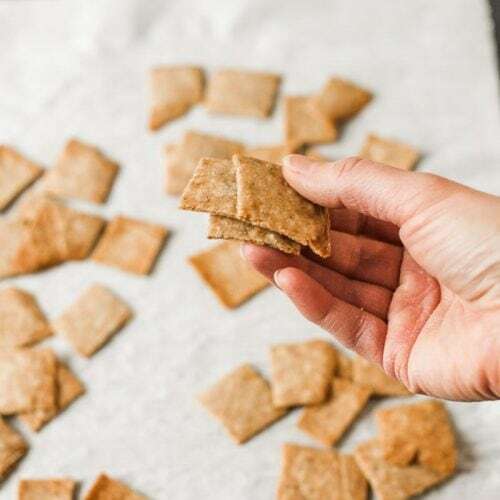 We used a pre-made MiDel gluten free graham crust for this recipe, but you can always make your own crust, too. After we made this recipe, we did a bit of experimenting with another cheesecake recipe of ours (we’ll post it in about a month) and made our own chocolate cookie crust for that new cheesecake. Check out our Triple Chocolate Cheesecake recipe for instructions on how to make your own gluten free chocolate crust for this cheesecake. For the cookie crust on the other cheesecake, we put 25 Oreos (or gluten free equivalents) into a food processor and processed til they’re crumbs. Then stirred in 1/4 cup melted coconut oil. Press this mixture into a pie plate, and chill till set. So yummy! 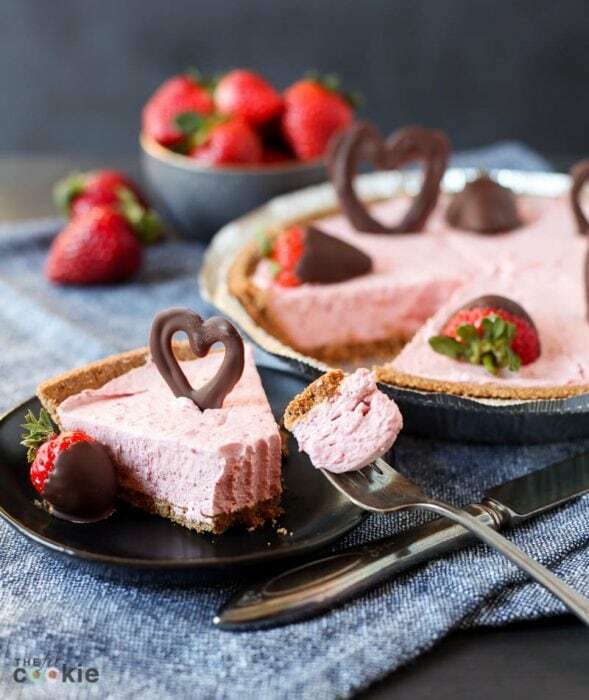 You can decorate your strawberry cheesecake a couple of different ways: with chocolate dipped strawberries, or homemade chocolate hearts. For the chocolate dipped strawberries, I used small strawberries, left the stems on, and cut the strawberry in half lengthwise to make them sit flat on the cheesecake. Then we dipped them in melted allergy friendly chocolate, and set them on parchment-lined baking sheet and chilled till set in the fridge. If you’d like to make the cute chocolate hearts, melt some allergy friendly chocolate, and draw shapes with it on a parchment-lined cookie sheet. Then chill till set. You can use a small spoon to make the shapes, a squeeze bottle with a small opening, or a plastic bag with a tiny part of the corner snipped off. There are some companies that make tools for making shapes and molds for chocolate, but I haven’t sprung for any yet (I definitely should!). In a medium bowl, beat the non-dairy cream cheese with a hand blender until softened and creamy. Add the powdered sugar and vanilla, and beat again. Add your freeze dried strawberries to a mini blender or food processor and process until it’s a fine powder. Add the strawberry powder and 1/2 the container of CocoWhip to the cream cheese and beat again until mixed. Fold in the other 1/2 container of CocoWhip until mixed well, and spread the cream cheese mix into the gluten free graham crust. Cover and chill for about 6-8 hours until set. Serve topped with your chocolate shapes or chocolate strawberries. Enjoy! For chocolate hearts or chocolate strawberries: melt 1/2 cup allergy friendly chocolate chips in a small bowl or cup set in hot water in a pan (microwaving is faster but less consistent). 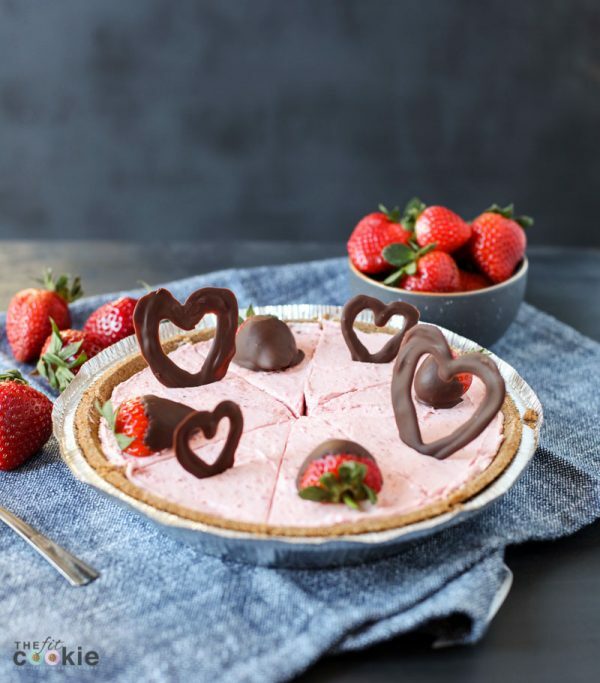 Make shapes with the melted chocolate on a parchment lined baking sheet, or dip strawberries in the chocolate and set them on the parchment paper. Place the chocolate shapes in the fridge until set, then add them to your cheesecake when you’re ready to serve it. ** If you want to make your own cookie crust, put 25 sandwich cookies into a food processor and process til they’re crumbs. Then stir in 1/4 cup melted coconut oil. Press this mixture into the bottom and up the sides of a pie plate, and chill till set. Once it’s chilled for about 30 minutes, add your filling. I use the freeze-dried strawberries to make “cheesecake” too! IT works so perfectly. 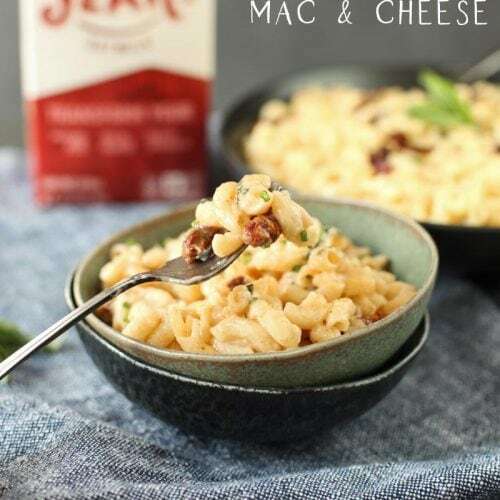 I’m actually glad to see a simple recipe using Daiya – I get requests for this often! This looks amazing Sarah!! 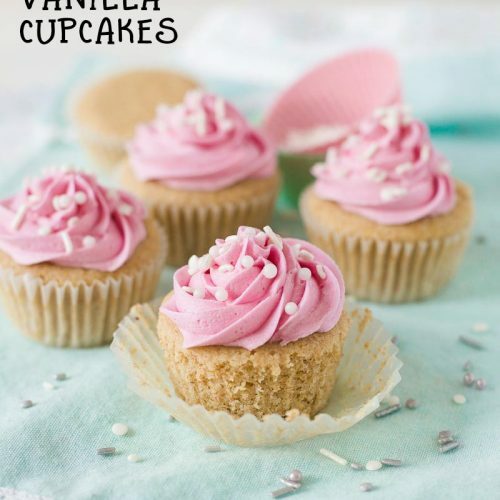 So creamy and fluffy it would be perfect for Valentine’s or anytime. I won’t have time to make it today but I’m saving the recipe as I think it would also be perfect for Easter! This is just so pretty and mouthwatering too! 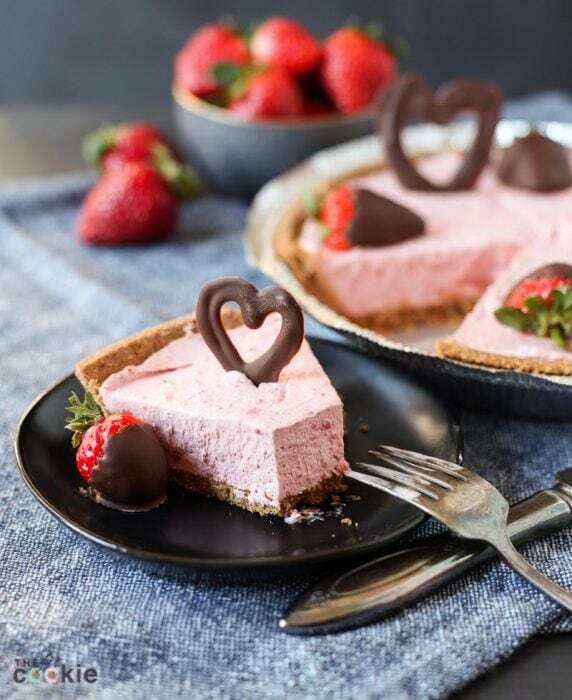 I’m a sucker for a pink cheesecake and the decorative chocolate is the perfect finishing touch! Love! This looks delicious! There is not much better than strawberries mixed with cheesecake!